Strong year for 2009 graduates going to play in college. Here are the OPSA Mamba players going on to play at the next level. Great year again for the ladies, click on the image to be taken to the team website. The Tigers wrapped up the #2 seed tonight with their win over the Chiefs. The game-winner came 13 minutes in when Megan Stodden’s run into the box was rewarded, first receiving a pass from Megan Gunnel’s before slipping between a pair of defenders prior to shooting. While the score will draw plenty of attention, it was Paige Hemphill’s play between the posts that made a significant difference as the Chief’s attack was working well this evening. A key noted by Coach Tom Davidson was a save on McKenna Adam’s who was able to get inside the box but her shot was smothered by Hemphill who waited to react to the shot. Shortly after that, the Tiger’s counter was begun when #13, Jackie Wacha, came well back into the defensive end on the strong side from her forward position and collected a ball cleared from the box. Her long ball down the right side was just over the head of the defender and sent #18 Alicia Collard streaking towards goal, never a pleasant site for a defense. Senior Eva Schwert (#21) was stride for stride with Alicia and was sent in alone by Collard’s square ball, after pulling the lone defender to her. Schwert easily lifted the ball over the charging goalkeeper and into the right side of the net, just inside the upright to give the Tigers a 2-0 lead in the 32nd minute. The Tigers had another excellent opportunity only 2 minutes later but Shannon Johnson, and the Chief’s defense, was prepared. Senior Abby Anderson, who creates many opportunities from her right midfield position, in this case was back to block the first attempt while Johnson rebounded to block the 2nd attempt and the 3rd was sent over the crossbar. The second half saw the Chiefs come out energized and in my opinion they had the majority of the play. The key to the Tigers success this season, at home in particular, is their discipline and patience. They’ve learned to keep the ball on the ground and work the short passes on the artificial surface, a lesson that usually requires at least one half for the visitors to learn. The Chief’s responded well but their two best chances, both by sophomore Marin Gelsheimer #(15), saw her 20 yard shot go just over the cross bar and her run into the box blunted by Hemphill. The final goal was a wonderful counter-attack by the Tigers, with defensive midfielder Rachel Haden collecting a ball in the defensive end who sent Stodden on a run down the right side where there was lots of space. Alicia Collard soon arrived to receive the next pass, heading into the corner before releasing a fine cross to the center of the box. Jackie Wacha (#13) got to the ball before the defender and Taylor Jordan was at the back post to nod it into the open net, a fine reward for her long run made in support of the play from her midfield position. As I was editing photos, the Amazing Rhythm Aces “My Tears Still Flow” from the Stacked Deck album came on. Probably the theme song for many teams, including the Chiefs, who have had inconsistent offensive output this year. One of my favorite bands, I hope they come back to Wildwood Springs Lodge again soon! Goals – Rische (3), Haist (1), Frerichs (1), Bartell (1), Pavlowsky (1), and Bolton (1). Assists – Frerichs (2), Haist (2), Bartell (1), Rowden (1). Shutout – Miller, 8th on the sesaon. Jonna Welch put in all four goals for the Liberators, as these traditiional rivals battled in Bolivar. The offensive attack the large school Liberators have been using to work their way up the ladder in District 5 was more than the small school Jays could handle this evening, losing only their 2nd game of the year (both to larger schools). #12 Liza Salisbury had the goals for Greenwood. Lauren Copple scored the first goal when she once again placed a corner kick directly in the net, unassisted. At the half, Joplin was up 1 to 0. Kelsey Sanders’ goal in the second half placed Joplin ahead 2 to 0. With just under 6 minutes left in the game, McAuley’s Arielle Santillian scored. A Class 3 District 11 match up, the Falcon’s solidified their #1 ranking in the region with their win over the Chiefs. Lindsey Sprouse (2G/1A), Hannah Garrad (1G), Molly Brewer (1G – PK), Emilee Williams (1A), Emily Cline (1A) scored for the Falcons while Amanda Dominguez (1G) and Abby Anderson (1G -PK) scored for the Chiefs. Class 3 District 10 match up went to PK’s Thursday with Rolla winning the shootout 2-0. The Lakers led 1-0 early in the second half before Rolla tied it up at 1 goal each. Class 3 District 10 match up, the Jackets ensured they kept pace with the Lakers and Jays in their pursuit of the Bulldogs for top seed in the District. The Yellowjackets got goals from Emily Boyer and Hannah Winkel. In this Class 3 District 12 match up, Joplin had several opportunities but had a hard time getting it in the net. 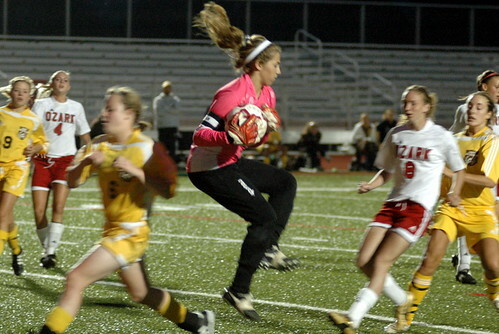 Joplin scored first when a shot by Kelsey Sanders was deflected by the goalie and Meghan Matheson was there to put the loose ball in the net before it could be cleared. Joplin was up 1 V 0 at the half. Hillcrest tied it up with a nice shot by Erin (#39). With about 8 minutes left in the game, Sanders accepted a nice pass from Yasmin Ulloa, worked the ball down field past the Hillcrest defenders, went one on one with goalie and placed the ball just inside the net.